More great stuff from Brimbank Libraries! If you haven’t visited the Brimbank Libraries website in a while, jump online and check it out as it’s better than ever. What’s different about the Brimbank Libraries’ website? The Brimbank Libraries' website has been updated to make it an even better resource for the community, and much more user-friendly. The website has now got a great look and feel, and it is easier to find what you’re searching for. The site is mobile responsive, and now has new feedback options and a comment system. 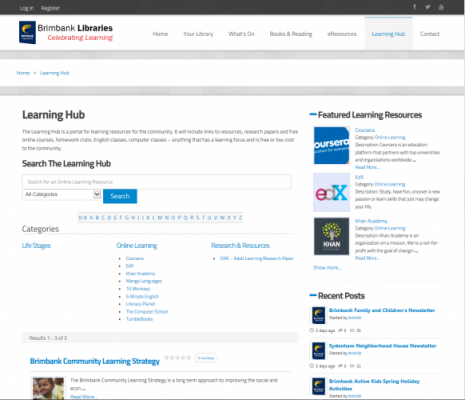 You’ll also find a new Learning Hub on the Brimbank Libraries website. This is an online portal on the Brimbank Libraries’ online library website, through which you can access a wide range of learning resources, all at no charge. This could be to online courses, English classes, and computer classes – anything with a learning focus and is no charge or low cost. The Learning Hub will also enable you to exchange information, via a community noticeboard forum on the Hub. This exciting new service for community members will complement the extremely wide range of resources that Brimbank Libraries already offers the community. Our Online Library is already a very popular resource for the community – our records show that that there are more than 70,000 visits each month. We anticipate that the new Learning Hub will also encourage greater usage of the Brimbank Libraries website, and its range of electronic learning resources. This exciting new service for community members adds to the extremely large resources that Brimbank Libraries already offers the community, and will play an important role in encouraging lifelong learning. Brimbank’s five branch libraries provide programs and services for all residents, including conversation clubs, study facilities, Internet access and a collection of over 230,000 items, with 30 per cent of the collection on loan to the community at any given time. Online services delivered through the library’s website include databases, e-books and newspapers in over 60 languages.